Wide-scale popular efforts have continued with wide participation to assist the victims of the rains and floods that affected several parts of the country during the month of August. The crisis brought to the forefront the true nature of the Sudanese people and their creative energies. It revealed their true values and customs, and renewed confidence in the Sudanese youth. In Khartoum State, The Nafeer campaign started on August 2 as a popular effort to mitigate the disastrous effects of the heavy rains and flooding, and has continued successfully thanks to the high morale and courage of its volunteers. Daily reports and appeals received by Nafeer from affected areas and populations on August 15 and 16 were 69 and 42, respectively. Most of these reports were from Sharg Elnil in Omdurman. Nafeer was able to assist these areas thanks to donations it received from all sectors of society, and to the selfless efforts of the volunteers whose numbers have reached 6,246 as of August 17. As previously mentioned, Nafeer and its philosophy are grounded in Sudanese traditions and values. It would not have succeeded and flourished had it not turned into a popular campaign, mandated and protected by the Constitution. Article 23 of the Constitution states that it is the duty of every citizen to defend the country, participate actively in its development, and to protect the environment. Article 75 of the Criminal Law stipulates that rendering assistance is a legal obligation and failing to do so is considered a criminal offence. In addition, Article 8 of the Civil Defence Law states that it is the duty of the State (represented by the Civil Defence) to encourage ‘nafeers’ (voluntary popular participation). In this respect, we are convinced that the scale of the damage caused by rains and floods makes it imperative on everybody to shoulder their social and legal obligations in assisting the affected population, and to abstain from other distractions. Nafeer is committed to act accordingly. We therefore express our gratitude to all those who established similar campaigns in various parts of the country; and we pledge our full support and put our experience at their disposal. Nafeer would like to confirm, once again, that it only accepts donations at its HQ at Jisr Center in Khartoum, Bahri (Sha’b Club) and Omdurman (Hashmab Club), as well as through its designated representatives abroad, whose information can be found on the official Facebook pages. Nafeer has no other representatives to receive donations besides outside these channels. “This just in: rainfall in Kosti estimated at 60mm (measurement will be made at 9pm) compared to 45mm estimated at Sharg Elnil. 13 people have died while trying to make their way out of Nawari, where they have been trapped since August 2nd due to the heavy rains and floods. Nawari and other areas that lie north of Khartoum are also trapped by the water; in Dardog, Sirbayoog, and Almadrasa all roads are impassable. The number of residents trapped in Nawari alone reaches around 500 people; it is still unknown how many are trapped in the other areas. “Welcome to the official English page of the Nafeer Initiative. Nafeer is a volunteer group of young people working together to aid families that have been affected by the heavy rains and flash floods in various areas of Khartoum State. This page aims to share the Initiative’s activities, updates and reports, as well as act as a call for volunteers, donations, etc. UPDATE: Follow Nafeer نفيـــــــر on Twitter here. UPDATE: An account from fellow Sudanese blogger Reem G. on the floods & the ongoing destruction. Click here to read the full post. 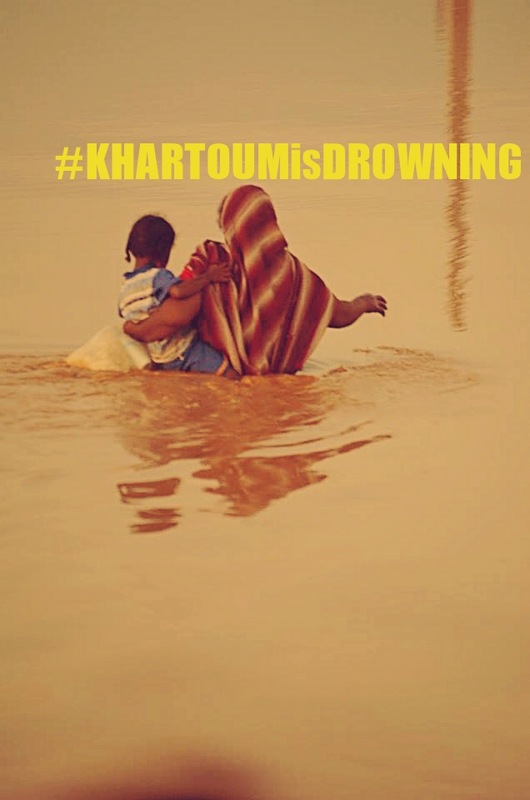 “While the majority of the people of Sudan endure harsh living conditions, and while they endured long hours of fasting for the duration of the month of Ramadan, the heavy rain and flooding that recently caused wide spread devastation to an already barely inhabitable mud houses and huts. We are trying to provide temporary shelters, tents , potable water to the people affected. My Name is Mohamed Ibrahim, I’m Sudanese lives & works in Calgary , AB. This is my Phone number if you want to discuss the relief your donation will provide +1 (587) 287 7096 . Please understand that I will do all that I can for your donations to reach the deserving victims. Transcending ethnicity, location within Sudan or any affiliations or religion. There are many organizations and groups in Sudan with well documented effort (I can dare to say covered live in the social media) who will see to it that this money will help the victims most in need, and not those who just want more. I have zero faith in any government or political party who sat on their hands as this disaster repeated itself year after year. At the end of the campaign and when the money has been transferred I will post detailed statement of accounts. PS: if you can read Arabic there is a face book page where people in Sudan and abroad coordinate their efforts. and provide images , phone numbers and information of people needing help & those providing it. UPDATE: A running segment on the floods from Aljazeera English, watch here. Given that the Government of Sudan has yet to respond to the ongoing catastrophe of recent flash floods in parts of Khartoum, there is a group that is caring. … meaning to achieve something collectively. And when there is no help in sight, especially from those whose job is to give relief to those in need, this youth group stepped in, and although seemingly miniscule, is providing a valuable account of the damage. Click here to see up to date photos of the extent of the damage. Nafeer is a volunteer group of young people who got together to offer a helping hand to those affected by the flood. Nafeer is non political, non religious and has no affiliation with any group. On August 1st and 2nd heavy rainfall in Khartoum state caused flash floods in various areas of Sharg Elneel, Karari, Umbadda and Khartoum North localities. At least 823 houses were completely destroyed by rain; the remaining 631 homes suffered partial collapse (i.e. houses did not fall apart entirely). All affected areas are in urgent need for water and food. Since the rain people have been surviving on unsafe tank water whose price has more than doubled. Markets in affected areas have also been flooded and food prices (if available) have soared. Since many families have lost their kitchens and cooking sets, canned foods, powdered milk, infant formula and ready-made food are the best options for distribution. Families whose houses have been completely damaged in Fath relocated from lower grounds to higher grounds. However, they’re completely exposed and are in urgent need for tents to shelter. Some families in Marabee moved to live in nearby schools as their homes are inaccessible. Others whose homes that have been partially damaged and continue to live there are also in need of tents. Most affected people are in need of sleeping mats, blankets and even clothes as they have lost all their belongings in the flash floods. Electricity has also been cut off some areas and people are in need of flash lights. Some areas require complete evacuation and relocation for affected families. Areas affected: Marabee Ashareef, Soba Sharig, Umashosh and Umdawanban in Sharg Elneel, Alfateh 1, Alfateh 2 (blocks 10, 11, 15and 41), Alfateh 3 and Alfateh 4 in Karari, Dar Elsalam block 3, Alamriya blocks 28 and 29 in Umbada and Aldorooshab in Khartoum North. * Figures cited are estimates and only indicative of areas reached by Nafeer. Actual figures are expected to be higher. No I have not come across this initiative! Thank you for bringing this to my attention. To post this is to defeat epidemic defeatism in a country forsaken by hope. Thanks.